Continued from Collecting Trip to India: Part 2. We started our journey to Mangalore the next day. It is about a 100 kilometers from the town of Subramanya, where we collected the previous evening. 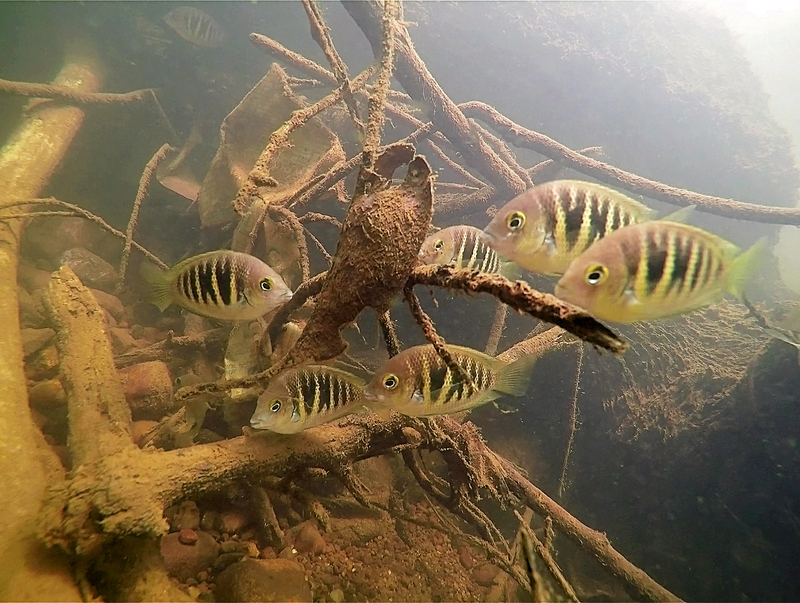 Rahul told us about a location where he had had great success at finding big schools of Etroplus canarensis, commonly known as the Canara Pearlspot Cichlid or Pearlspot Chromide. As I mentioned previously, I had been on a collection trip in this area back in 2012. That was a fantastic trip, but we did not spot any Etroplus canarensis during the whole trip. So when Rahul told us that there is a possibility that we would see a lot of Etroplus canarensis, I was pretty stoked. After driving for about two hours, it was close to noon when we reached the location. The sun was high in the sky and temperature was close to 90-95F. Our collection destination was again a location under a bridge. A trail from the side of the road took us under the bridge and down to the water’s edge. While surveying the location, I saw a lot of underwater activity going on. I was ready with my camera to go underwater and make some videos. Haludaria fasciata, or Melon barbs, schooling. 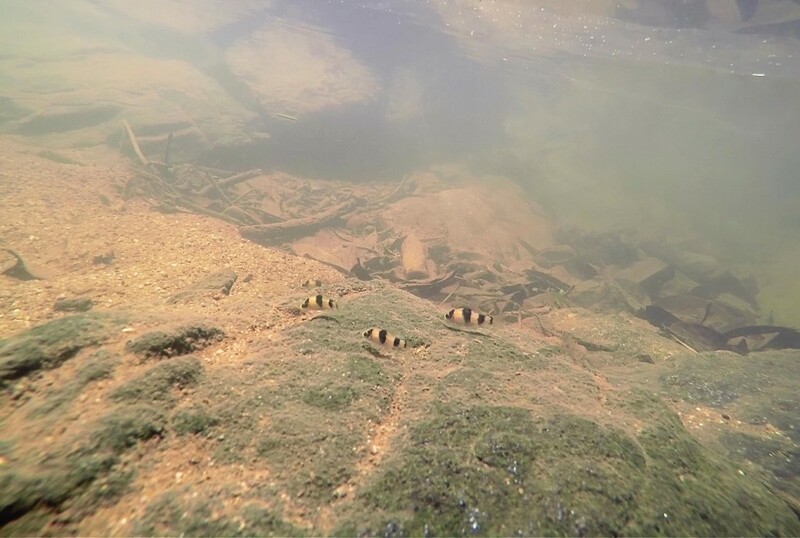 The following video shows Haludaria fasciata (Melon Barb), Rasbora dandia (Slender or Broad Line Stripe Rasbora), Etroplus canarensis juveniles (Canara Pearlspot Cichlid), and Dawkinsia assimilis (Maskara Barb). At 1:59 in the following video, notice a very interesting behavior shown by Etroplus canarensis juvenile; it turns a leaf with its mouth and then takes a moment to check if there was anything to eat under the leaf. I noticed this behavior in the adults, too. The water in this location was very clear and wasn’t more than 5 feet deep at the deepest part of the river. I spotted a fallen tree trunk in the river right under the bridge; it must have been the result of heavy rains and flooding. As I started moving towards the tree, I started seeing more and more of Etroplus canarensis in the water. 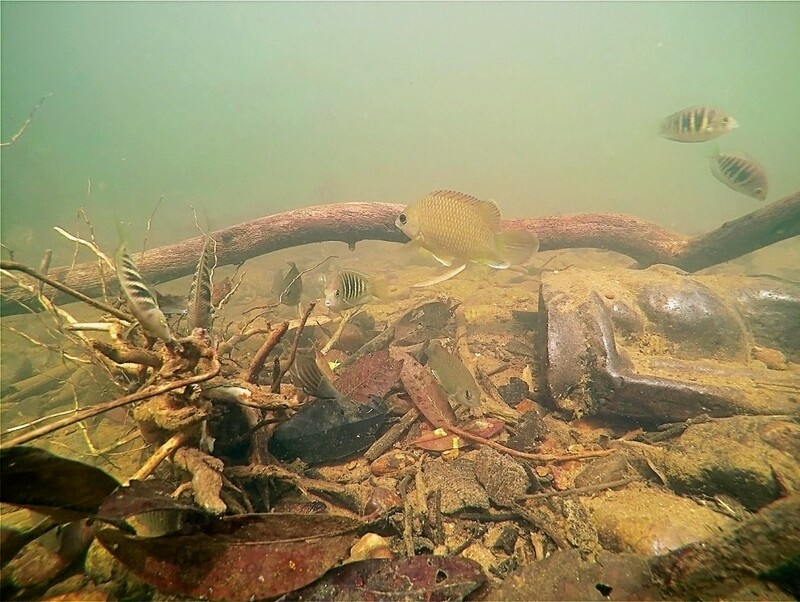 The size of specimens gradually increased as I moved towards the deeper area of the river. Note that the previous video was made close to the bank of the river and you can see juveniles of Etroplus canarensis there. When I reached near the tree that was stuck under the bridge, I got to see a real Etroplus canarensis heaven. The specimens here were almost 4 to 4.5 inches in length. 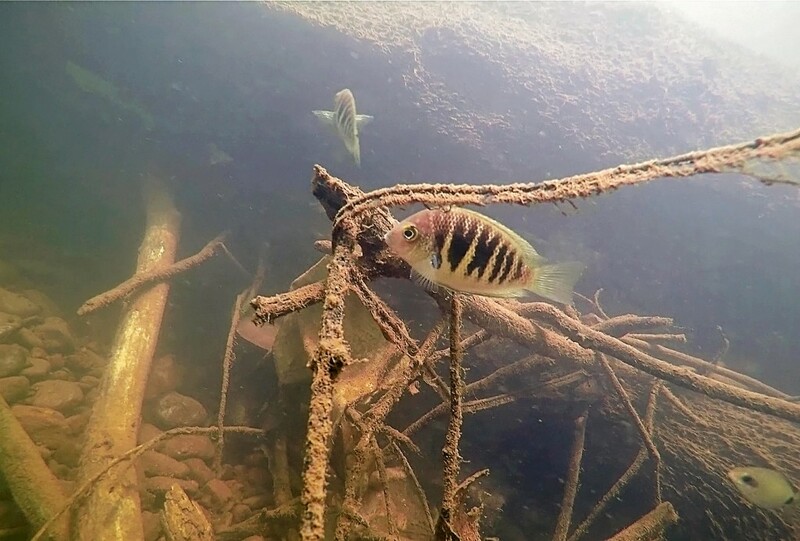 These Etroplus canarensis were eating the algae that was growing on the submerged tree. This rich food source explained why the fishes had congregated by the tree. Pristolepis marginata (Malabar Leaffish) were present in large quantities at this location. Pristolepis marginata (Malabar Leaffish) was also present in large numbers. Some of the adults I spotted were easily 6 inches or more in length. Etroplus suratensis (Green Chromide Cichlids) were also present here, but I only spotted two or three individuals. Etroplus suratensis happens to be a famous South Indian delicacy, too. Hypselobarbus jerdoni, or Jerdon’s carp, can reach 18 inches or more in the wild. I can’t help but notice the roman numerals on Etroplus canarensis’s body. All the adult specimen have this pattern on their body. We spent the whole day at this location, taking photos and videos of fishes. 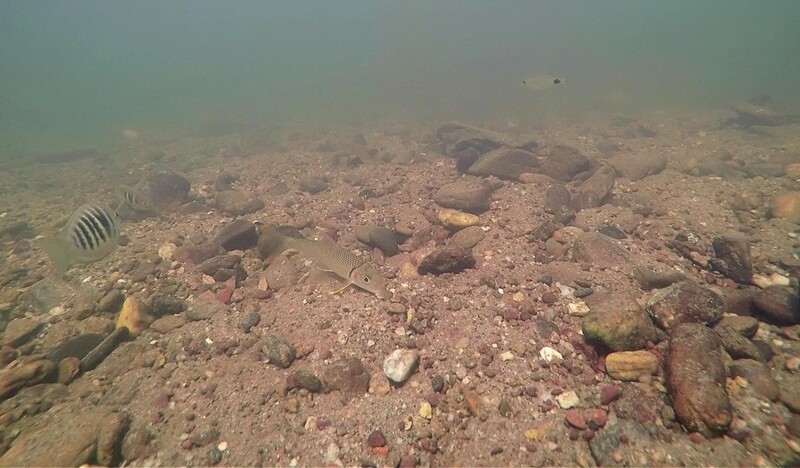 In the next installment, I will talk some more about the Etroplus canarensis we encountered here, and show you a beautiful goby and an eel that we also found at this fish-collecting hotspot!